The Big Little Caravan of Joy at Dagbamete's primary school in 2011. Through the arts and through play children open up and allow their natural creative abilities to shine. Unleashing the creative potential of children is a key goal of the Empowered Child Conference. Coming to Dagbamete this October is a special event designed to promote the idea that the arts are essential for the development of children. Billed as the "Empowered Child Conference," the event will bring teachers, educators and artists together to discuss and demonstrate ways of unleashing the natural creativity of children using the visual arts, music, dance and play. Thirty teachers will be invited from schools across the Akatsi District to participate in the three day conference which will feature educational arts workshops led by notable artists who work with children. A scene from the Big Little Caravan of Joy event held in Dagbamete in 2011. Children dancing at the encouragement of event leaders in costume. The conference is being organized by Sarina Condello, founder of the Canadian charity Big Little Caravan of Joy, and Kwasi Dunyo, professor of African music at York University and the University of Toronto. Professor Dunyo operates a summer school for African music in Dagbamete. He is also an elder of the village. Child development experts have long recognized the importance of play for social and emotional development, for learning and creative development, and even for healthy physical development. Researchers have shown that creative play stimulates imagination, curiosity and experimentation, and strengthens the child's ability to adapt to change. Ms. Condello's charity Big Little Caravan of Joy has operated creative arts workshops for disadvantaged children throughout Africa and in the native Canadian communities of northern Canada. In 2011, the charity organized a successful three day workshop for the children of Dagbamete. 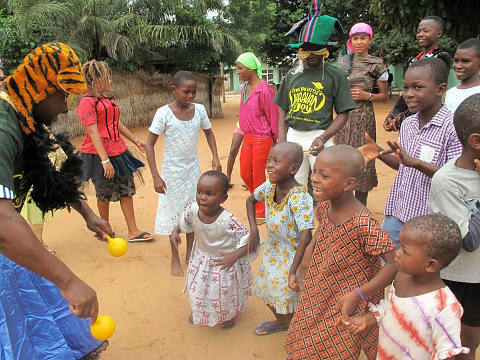 Having seen the benefits of the workshops, and seeing the need for more of them in Ghana, Ms. Condello realized that a conference to train teachers on how to incorporate play and the arts in the schools would be a next step. She and co-organizer Professor Dunyo hope that the conference will spark more workshops in the future to help children become creative and productive members of a fast changing world. 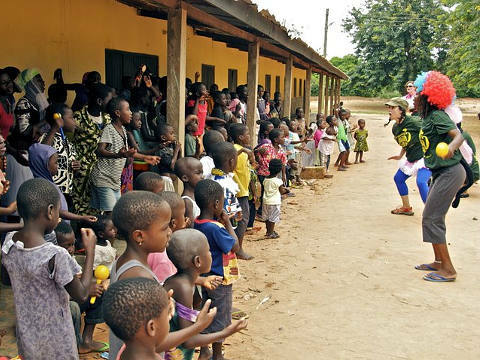 Sarina Condello, conference organizer and founder of the Big Little Caravan of Joy, talks about her work in promoting creativity among disadvantaged children in Africa through the arts. Already the conference has garnered support from the local Member of Parliament, Bernard Ahiafor, who suggested that the conference be expanded to include 12 schools of the local District of South Akatsi, according to Professor Dunyo, who recently was in Dagbamete for the annual Easter festival. And in a letter addressed to the Big Little Caravan of Joy, the District Chief Executive of South Akatsi, Samuel Wuadi, pledged the support of the District Assembly. The conference will take place October 24-26, 2016, in Dagbamete. Besides attendees from the district area, the organizers are expecting participants from Canada and America. Anyone wanting more information about the conference can contact the organizers Sarina Condello or Kwasi Dunyo.